As the horse progresses in his training, you begin “layering” new things on top of what the horse already knows. If you have a problem, you go back to where the horse last accepted everything and start over from there. 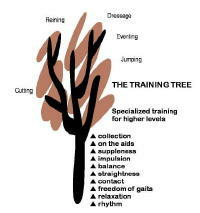 Rhythm is at the bottom of the training tree because doing everything in a consistent, predictable way gets the horse’s attention and builds trust in the horse. When you’re doing things rhythmically and you are never quick or abrupt or “startling” to the horse, then the horse will relax. Now you can start to work with his mind. You know whether the horse trusts you or not by watching his body language. His breathing will tell you if he’s relaxed or not. The position of his ears and his eyes will tell you where his attention is. The set of his tail and the degree of tension in his facial muscles, his neck muscles and his back muscles are other clues to his state of mind. In the beginning, you need some mechanical guidelines for judging whether a horse is relaxed. Remember, though, that part of what any horse presents to you is just his personality, separate from the specific body language he’s giving you about how he feels at the moment. Eventually you just want to develop a feel for whether the particular horse is relaxed or not. Then anytime you lose it, you just go back to doing something in a rhythmic way until the horse puts his attention back on you and relaxes again. To maintain relaxation or enforce it when the horse loses it, you have to stay relaxed yourself. That can take a lot of self discipline. For example, if a horse steps on your foot, you can’t startle him with a big yelp or a hard slap. You just have to stand there and take it a little while you show him the change you want him to make so he gets off your foot. You stay dominant in the situation by keeping your cool. It works the same way if the horse starts acting up a little and playing games or calling to the horses on the other side of the arena. You enforce the relaxation by staying relaxed yourself, refusing to get involved in the horse’s game, doing something in a rhythmic way to get the horse’s attention back on you. Let’s say you’re walking along with the horse in a round pen doing some ground work with him and the horse starts to get excited. You stop and start some scratching and more scratching and more in a rhythmic way to get his attention back on you. If the horse’s activity drive builds and he needs to spend it before he can pay attention to you, then you unhook the lead and step back. You don’t add to the activity drive by chasing him or doing anything exciting. You just walk along in a bigger and bigger circle farther behind him to just give him a feel of where you are. Eventually the horse will stop and look at you. Then you stop and step back to bring the horse up to you. The key is that you always move in a rhythmic way that never startles the horse or chases the horse or makes the horse feel that you are a predator. Rhythmic, consistent movements will help the horse relax and be receptive to what you want to teach him. Here’s another example. You’re saddling a green horse for the first time. You do some rhythmic ground work to warm him up and settle him down, then you bring the saddle in and set it down where he can see it. If the horse gets excited, you just stand there and don’t add to the excitement by insisting that he do anything in particular. You let him pick the distance he feels comfortable from the equipment and maybe you do a little more ground work. Eventually, he’ll come in and put his nose on it. When he’s totally bored with it, you start showing it to him on both sides by picking it up and down. You only lift it as high as you can without losing the relaxation. So you put it up and down, higher and higher until he’s bored with it. You break everything down into the smallest possible pieces and intentionally follow some kind of rhythm in introducing each little piece. If you’re riding the horse and he spooks or jumps, you do not punish the horse, you do not react, you don’t stop if you can help it. You just go back to riding with rhythm and relaxation, ho hum, and get control of the mood again. If it’s hard for you to stay relaxed, concentrate on your breathing or try humming or whistling or singing something to yourself. You have to teach yourself to work in a rhythmic and relaxed way before you can teach your horse to work that way. When you’re using nuances like rhythm and relaxation to control your horse, it doesn’t look like much is happening a lot of the time. Most people want to use dramatic pressures because they create activity and that makes it look like they’re doing something. Rhythm and relaxation are the bridge between the heeding system of ground work we teach here at Meredith Manor and our riding program. Students who learn to work with rhythm and relaxation develop a mental discipline that allows them to work with rhythm and relaxation when they’re riding the horse. They learn to use rhythmic and relaxed body language on the ground to create feelings of shapes in their horses. Then, from the saddle, they learn to apply the aids in a rhythmic and relaxed way to create feelings of shapes they want the horse to take. To control the horse’s body, you must control his mind. To control the horse’s mind, you must get his attention. Rhythmic movements as a member of the “herd” get a horse’s attention and make you a safe place to be. Continual rhythmic movements with no interruption, no startle, help the horse relax so you can start to work on his mind.